Mysterious rumors that there is a treasure hidden in Nachal Achbara in the Safed mountains, take wing and for hundreds of years bring in its wake Kabbalists, scholars, rulers, adventurers, pirates and regular tourists. They walk through its riverbed or skip through its tall cliffs in the hope that they will find a small piece of the gold hidden in its curves. The tradition - whose source was evidently the Kabbalist community in Safed - began at the end of the 16th century, claiming that hidden in Nachal Achbara, its cliffs and Ein Kahal that is in its riverbed, are the vessels and treasures of the Temple. This tradition was based on three sources. The first was the book written in Amsterdam by the Kabbalist Rabbi Naftali Ben Yaakov Elchanan, “Emek Hamelech” (1684), that hinted that there were hidden treasures near Ein Kahal. The second, “Chibat Yerushalayim”(1844) by Rabbi Chaim Horowitz stated “Next to Achbara, on the road that leads from Safed to Tiberius, there is a large, deep valley. At the bottom of the valley, there is a stream of clear water called ‘Ein Kahal’. Cross over it and on the eastern side there is a very large mountain. At the top of the mountain, an image of a closed gate is etched. On this mountain, the ancient and valuable vessels of the Temple are hidden”. In the third book “Shaarei Yerushalayim”, Rabbi Naftali Reisher describes how Napoleon’s soldiers searched for treasures in the river. 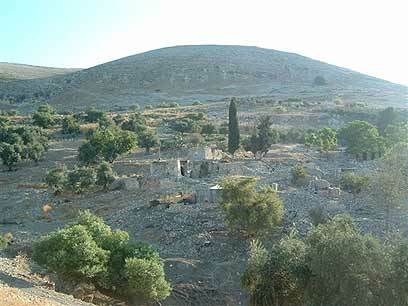 The village Achbara retained its Aramaic or Hebrew name, as did the other villages in the area - Kadita, Naburia, Dalta, and Gush Halav. Like the others, Achbara was a Jewish settlement from the times of the Talmud, that was abandoned by it Jewish inhabitants around the beginning of the 12th century. The stone houses and ruins of the ancient village are situated on the eastern bank of the river, and preserve its memories in their walls. It retains the memory of the Arab village Achbara, whose inhabitants abandoned it upon hearing the sounds of war during the days of our independence. It retains as well the memory of the ancient synagogue, remnants of whose walls remain in ruins from the days when the Jews of old frequented it. The houses of modern Achbara are made of brick and its roads are paved with asphalt. When the Arab residents of Achbara fled in ’48 to Lebanon, the Arab residents of Kadita who were also fleeing the battles and were migrating on their way towards Jauni – today’s Rosh Pina - filled their place. They settled, due to the munificence of Mr. Friedman, son of the legendary “Yosef Afendi”, in the abandoned houses of Achbara, after they signed statements that they would never return to Kadita. Once you lift your eyes toward the cliffs, you will understand why this place is so popular. At its peak, 200 meters above the riverbed, you can see a natural arch hewed in stone. It looks like a large, closed gate that could only have been chiseled by a giant’s hand. Where this high “gate” leads no one knows. Maybe it leads to the hidden treasures. It is no wonder then that Napoleon chose, at the moment when he was laying siege to Akko (1799), to send a group of his soldiers a day’s journey away to search for hidden treasures. There are those who say that all the rockslides at the foot of the cliff were caused by the French explosions. A short distance from the gate on the abyss, one can see openings to caves and many mysterious niches. There in the clefts of the rocks was one of the rebels’ fortresses during Roman rule. Yosef Ben Matityahu, commander of the Northern front in those days, fortified the Achbara rocks as he fortified seventeen other fortresses in the Galil. On my walk through the orchards of the ancient villages and also on the ridge of Ramat Razim above, I discovered flowerbeds of myrtles between the stones. They stand out as green stains on the white rocks. They have been and continue to be a source of livelihood for many Safed families. According to tradition, the myrtle, “a bough of thick trees” (Leviticus 23:40) is one of the four species on which blessings are recited on Sukkoth. The Ari Hakadosh, whose home was nearby, would gather and smell the myrtles during the havdalah ceremony. The holiness of Achbara never ceased. At the top of the mountain is the grave of the Tanna, Akavia ben Mehalel, who coined the following saying: “Know whence you came, whither you go, and before whom you give justification and reckoning” (Ethics of our Fathers, chapter 3). Once upon a time Rabbi Moshe Cordovero would come with his students to the river for prayer and seclusion. There are seven streams that flow in the riverbed, and of all of them Ein Kahal is elevated on steps of holiness, even though it is the lowest of all the streams. There are those who claim that an identification error located the blessed stream on the bottom of the mountain, when its real location should be where the waters of Ein Sela flow today. Yet who are we to enter the discussions of such insignificant matters, since the only ones to drink from both streams is Abu Chalad’s flock of sheep? Even those travelers who walk on the road between Safed and Tiberius rarely dip their feet in the stream since there is an asphalt road winding between the two holy cities. North of the ancient village, a suspension bridge crosses the riverbed. It is the highest bridge in Israel. It is 80 meters high, and even though it took 20 years to get it upright, the view upward from its base is ten times nicer than the one from the top. If you continue north above the river towards Ramat Razim, you will encounter the ancient stone terraces, trees that are hundreds of years old, and the orchards that were abandoned by the wealthy men of Safed in 1948. Olive, pomegranate, almond, and oak trees, as well as strawberries and grapes, take root in the ground and intermingle in a wild beauty that has been untouched by man for hundreds of years. A rocky path leads northwest, exiting the river towards Ramat Razim and the new neighborhoods of Safed. On the outskirts you can see the flock of the Meiri family, which produce quality Safed cheese. A discerning eye will notice that the road is level and paved with stone, and near the peak there are reinforced water holes, observation posts and mortar positions and other fortification remains that are just waiting for the enemy. This was part of the defense system built by the British in 1942 in cooperation with the Yishuv, under the auspices of a project called “Masada in the Galil”. It was intended to serve as a defense infrastructure in the case of a German invasion. You can enter Nachal Achbara from the new road between Elifelet and Ein Zeitim. Turn south near the bridge according to the sign on the bridge until the houses of the modern village. Park your car where the asphalt ends and glide down. You can also begin at the Begin neighborhood at the lower edge of Tsfat from the east (Route 89). For those with a 4-wheel drive, it is recommended to begin at route 85 next to Kedarim junction. With regard to the treasure, I recommend you follow the advice of Rabbi Naftali Reisher: “Your efforts will be for naught, the treasure will not be revealed until the arrival of the righteous messiah”. See all talkbacks "Nachal Achbara: A treasure of a river"